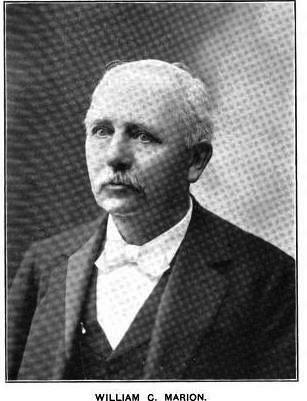 Frank Raub was proficient at two things in 1888—real estate development and the saloon business. For several years he managed the successful saloon known as “Hillen’s” near the entrance to the Brooklyn Bridge and had dabbled in real estate. With the population of Manhattan exploding and the financial potential of the downtown area ripe, he combined his two talents into one project. Purchasing the small buildings at the corner of Fulton and Nassau Streets, he hired architects De Lemos & Cordes to design an office building with restaurant space on the first floor. 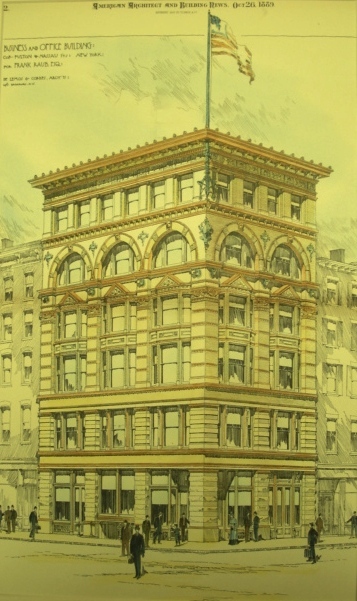 Theodore W. E. De Lemos and August W. Cordes had been in partnership only four years and their robust design would foreshadows the grand office buildings and department stores to come; among them the New York County National Bank and the department stores of Siegel-Cooper, Adams and Macy’s on Herald Square. Using buff-colored brick with limestone and terra cotta trim, the architects created a refined 6-story structure in five sections, ending with a complex cornice. Cast iron enframements enabled spacious window openings that allowed exceptional sunlight into the office spaces. The neighborhood was the center of the jewelry trade at the time and Raub’s completed building filled with related businesses. Among the first was Armeny & Marion, makers of high-end gold pens. Gyulo Armeny had arrived alone in New York from Austria-Hungary at the age of 19. After learning the jewelry trade in the Bronx, he started his own business at No. 75 Nassau Street. When he met pen-maker William Clayborn Marion his life would change. Unlike the immigrant Armeny, Marion was born to a prestigious family with French roots who settled in Kentucky in the 18th century. 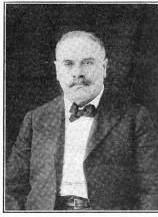 In 1900 biographer Cornelius Burnham Harvey would say of him “Breathing in his father’s house a wholesome mechanical atmosphere, and having received at the district schools a good rudimentary education, he left home at the age of fourteen and apprenticed himself to Andrew J. Berrian, a maker of gold pens at 75 Nassau Street, New York.” In 1884 the two men, now both masters at their craft, formed Armeny & Marion. In the building with Armeny & Marion was the prosperous watch dealer Charles D. P. Gibson. The interesting Gibson had served in the Civil War and for about 25 years was connected with the United States Secret Service. But Gibson’s viewpoints on religion were extreme. Happily the rest of the tenants in the building drew less negative press. Jacob Horowitz quietly dealt in diamonds and Rudolph F. Albrecht sold rare stamps. In 1893, with the building fully-leased, Raub commissioned architect A. L. C. Marsh to enlarge it. The handsome cornice was removed and two stories were added. Although Marsh attempted to meld the architecture with banded piers and terra cotta trim, the proportions were somewhat skewed. Meanwhile the business of Armeny & Marion continued to flourish. In 1893 Gyulo Armeny purchased the building from Raub, renaming it the Armeny Building. Frank Raub continued running Raub’s Saloon at street level. In 1900 the National Loan Association took space in the building, about the same time that Raub hired a new cashier, the 21-year old Martin J. Tighe. Tighe, whom The New York Times described as “an inveterate cigarette smoker,” was abusive to his young wife. In the Fall of 1900 he threatened to kill his 17-year old wife and her father, but when police disarmed him he “promised then to do better and was not arrested,” said the newspaper. In April 1901 the couple had a baby boy and when the abuse continued, the young mother left Tighe to move back into her father’s home. Tighe stalked the building and on June 11, finding the door unlocked, he went up to the apartment. When his wife opened the door he grabbed her by the hair, dragged her into the hall and beat her with his fist. The enraged man bit his wife’s wrist until blood ran. Although he was arrested, his father signed his bond and he was released. It was a move that would end the 18-year old mother’s life. The girl returned to her father’s apartment and so too did her husband, who loitered around throughout the afternoon. Around 9:00 that evening with the protection of her aunt, Margaret Schaffney, Mrs. Tighe went back to the former apartment she had shared with her husband. She hoped to get clothes for the baby. After only a few minutes of their being in the apartment, Tighe burst in and threw Schaffrey out, locking the door. When the aunt failed to find a policeman, she rushed back to the apartment and broke the door down with her shoulder. Tighe flew past her and into the street. The young wife was on the kitchen floor slashed in several places by a razor. Within the next few years jewelry firms were slowly replaced by law offices. In 1902 Ralph Gillett opened his practice here and two years later the law firm of J. & W. Shrady was here. Scandal visited the building in 1913 when former policeman Robert E. Ullner had his law offices in the building. That year an indictment was filed again him and his wife, Annie Grey, who, according to The New York Times “amassed a fortune as a keeper of disorderly resorts.” It was a polite term for brothels. By 1917 Raub’s Saloon was gone and in its place was the liquor store owned by Joseph Varon. Varon would remain here for at least two decades. On March 9, 1920 Gyulo Armeny was at his home in West Bronx, New York, suffering from gangrene poisoning as workers prepared an improvement to the building on Nassau Street. At 5:00 in the afternoon—the peak of rush hour—construction workers maneuvered an 800-pound cast iron flagpole base into position high over the sidewalk. Hundreds of businessmen and secretaries rushed along the sidewalk below. Suddenly the rigging broke. The giant iron base held for a second by a portion of the rigging, long enough for workers to shout a warning. The crowd below scattered in all directions not knowing exactly what the danger was. The Times reported that “In a second or two the 800-pound weight snapped the remaining ropes and shot downward…The cast-iron base broke, and the street was filled with huge fragments of iron and broken lumber.” Only three persons were injured. A month after the accident, Armeny succumbed to his 11-week illness. The sons of William Marion continued the pen manufacturing firm. Within a year The United Happiness Candy Store was here. The store had several branches, along with a club. “The purpose of the United Happiness Candy Club is to introduce our various kinds of Candy, and have the story of their goodness spread by all the members. Everybody who buys automatically becomes a member," promised an advertisement. Not all the jewelry firms left No. 90 Nassau Street and they proved to be a temptation for thieves. Charles Kresney ran his jewelry manufacturing shop here in 1924. On April 28 the cleaning woman walked in on a robbery by four gunmen and was immediately taken captive. The four bandits made off with $125,000 worth of jewelry. Kresney and the scrubwoman were found bound and gagged later. A year later, two days before Christmas in 1925 the jewelry manufacturer Folmer Pripp was robbed by stepbrothers Jacob and Leon Kraemer, along with gunman Milton (Shuffles) Goldberg. The boys were members of the notorious Whittemore gang, led by Richard Reese Whittemore. Goldberg was, according to newspapers, "the closest lieutenant" of Whittemore. A year later the robbers were sentenced; Goldberg getting 20 to 40 years in Sing Sing prison. His attorneys pled for a reduced sentence because he had an advanced case of tuberculosis. Judge Koenig, however, was unmoved. The New York Times reported that he "rebuffs plea of mercy based on his weakened physique." In 1955 jeweler Charles Krensky operated his business in the building. That year three hold-up men barged into the shop. Before they fled Krensky lay dead. By 1975 the street level housed a restaurant and bar, but the upper floors had been vacant for over a decade. Then in 1999 the building was renovated, creating residential space on the floors above the restaurant. Other than the zig-zagging fire escape, No. 90 Nassau Street looks much as it did after the 1893 alterations when the vibrant neighborhood was filled with jewelry merchants.